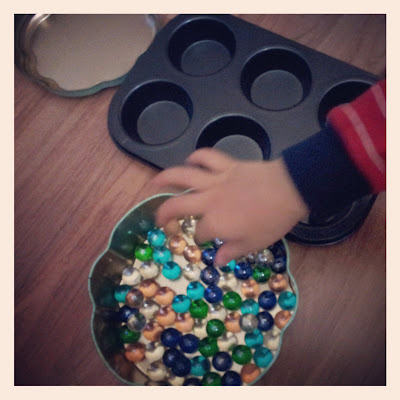 Recently we're doing counting with marbles. It was hard finding marbles in Penang. They're not stocked at major toy shops (choking hazard?) so a friend got me two bagfuls from a small aquarium shop and mum-in-law added another bag from the market. Bub's eyes went wild when he saw the bagfuls of marbles and got a stern warning on not putting any of them into his mouth. 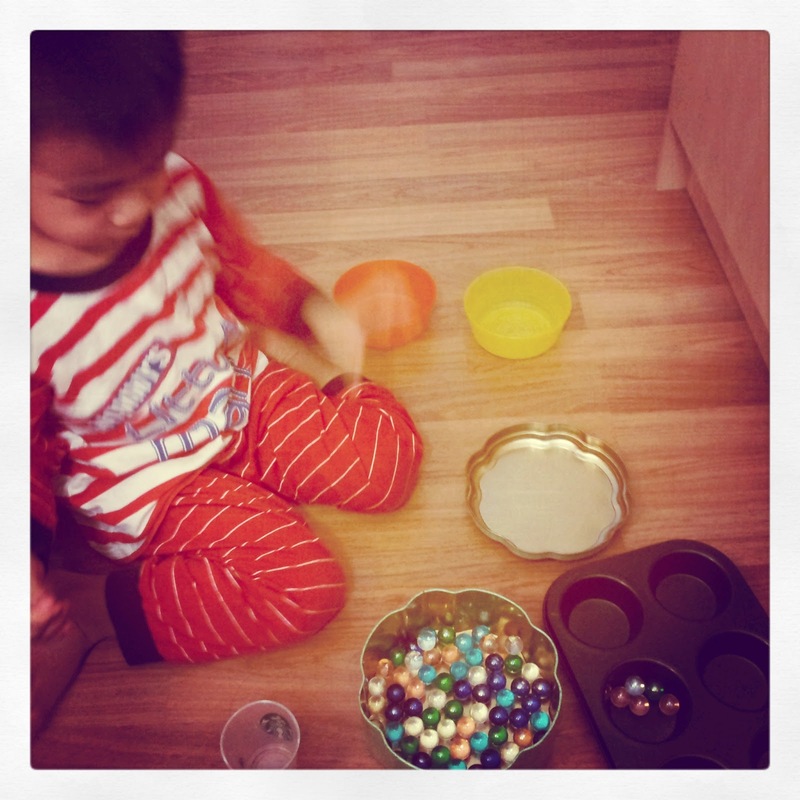 We previously did counting with stones but he found marbles so much more fun as they were sooo pretty. I gave him an old biscuit tin container to store the marbles in, a couple of smaller bowls, a muffin tin and a giant soup spoon which kept him occupied for a while. I was hunting all over the place for a nice congkak board which was nearly impossible to find here. Off the topic: did you know that congkak is actually an ancient game played not just here in Malaysia but also known as mancala around the world? A friend picked up this basic congkak board for me from Hatyai, it's wooden and the cool part is that it's fold-able so the board doesn't take up too much space in storage. The only complaint is that the pits are too shallow so the tend to spill out easily if there are too many standard sized marbles in them. Since Bubs is still a beginner, we're playing with 3 marbles in each pit instead of 7. Bubs and I squabble so many times over congkak! The first time he played, he insisted it was a train and choo-choo-ed it away from me. At other times, he insisted that he needed more marbles inside his home (the big pit or whatever you call it) and would sneakily sneak some marbles from the tin to his side. Cheater! What other old school games do you play?